Sorry if this is in the wrong section, but not sure where exactly this would go. 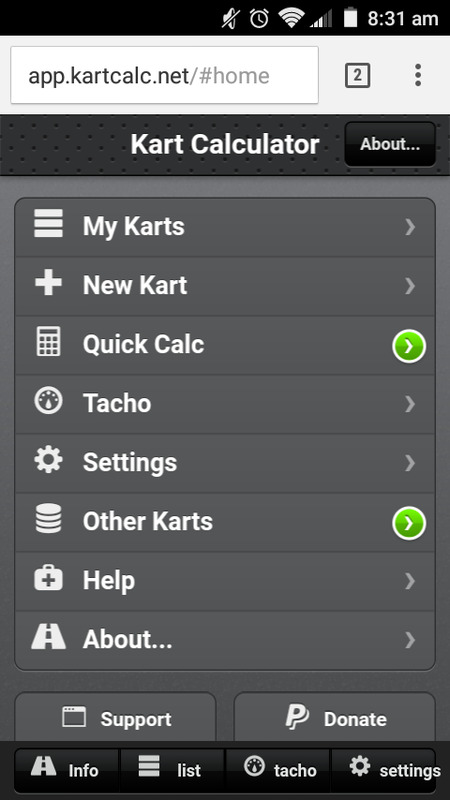 I am a member over at DIY Karts and another member on there took the time to make a pretty comprehensive calculator for gearing on karts to make it easier. Right now it's only available on mobile (smart phones and tablets), but he does have plans to expand it for using on the computer. As well as add more CVTs to the list, once relevant information is passed onto him. Currently just Comet 30 series with 6 and 7 inch, Comet 40 and 44 are on there, as well as using a centrifugal clutch. In the settings you can change from metric to standard (kg to lbs, cm to in, km/h to mph, etc). 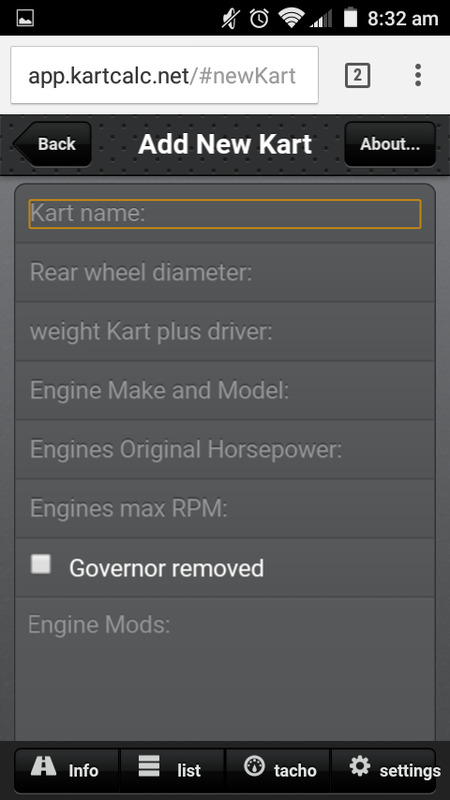 What you do is, you input the weight or target weight of the whole thing with driver/rider(s) and anything else you may carry, Diameter of rear wheels, horsepower of the engine whether or not the governor was removed and what rpm it runs at max, any modifications you have on it you write down (just be sure you figure what the actual or close to actual power is with the mods added), what torque converter/CVT your using or just a clutch or using a jackshaft or not and what the gearing is on the clutch or CVT (with or without the jackshaft, you have spots for jackshaft in and out) and what sprocket count is on the rear axle. Now it is a fairly conservative calculator, meaning it does say you may burn out your clutch or CVT belt, but in actuality you probably would not, it's just a safety precaution. 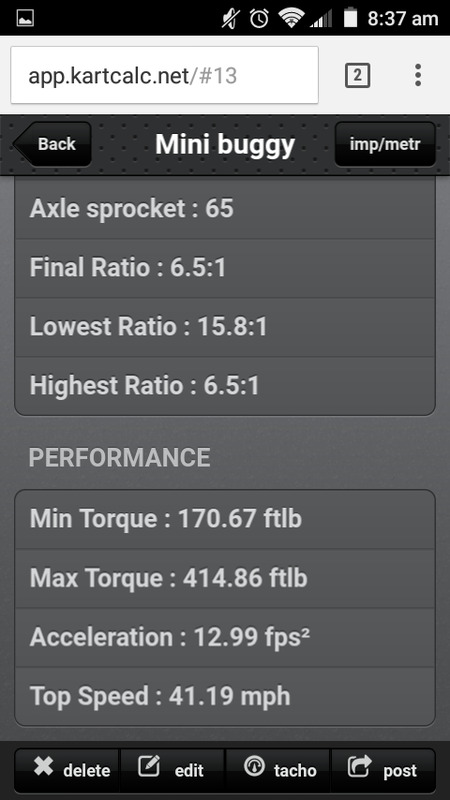 Once you put all the necessary information in, it'll give you the projected power of the engine (torque output) with and without the CVT and other gear reduction if any. It'll also give a top speed as well, and give you hints for needing more gear reduction, in order to save from burning a CVT belt out. He also put in an area to save your project as well as a tachometer and speedometer in lack of having one as putting a speedometer on a go kart is not an easy task. 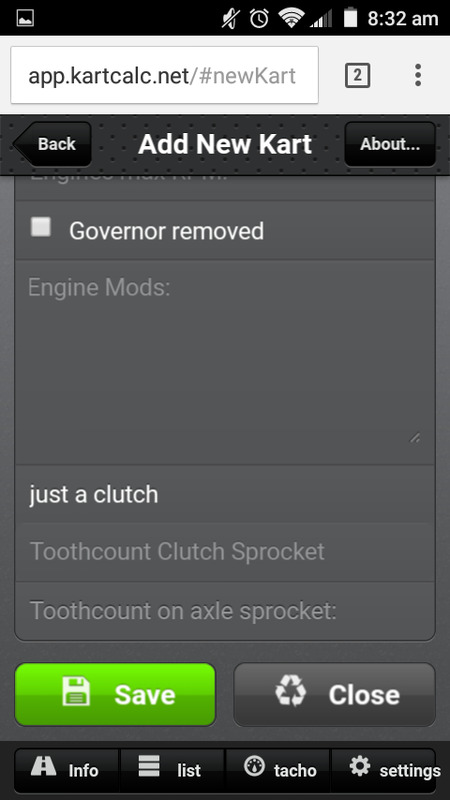 Now it only works on tablets and phones right now and the only engines it allows for are your standard Briggs and Stratton, Tecumseh, Honda/clones industrial type engines. Nothing yet for motorcycle engines and what not. Also some of the stuff, like some errors might be in German as he is a native to Germany. I'm using Tapatalk so I'm trying to as much as I can. If any of you have any questions I'll do my best to answer them, otherwise I can ask the guy who made it. Hope this could be of some needed help for people. It's pretty straight forward to use and user friendly. 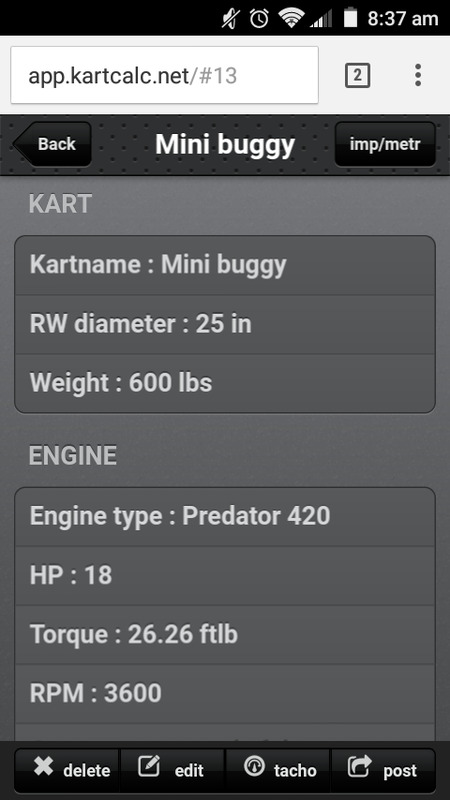 In the settings, you can change what units of measurement you want to use for weight, speed and length. However you may need to use the imp/metric tab to convert it to the results to what you need as something is interfering and ends up having the results in a mixture of imperial and metric. By kawabug in forum Show off your toys in here!